Welcome to Pine Mountain, your home away from home in Pigeon Forge, Tennessee. 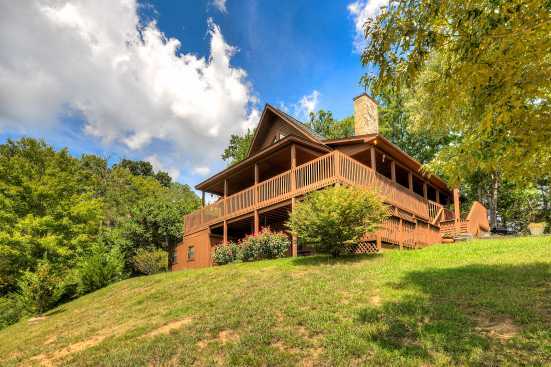 Pine Mountain offers a variety of cabins that can sleep up to eight adults comfortably. Amenities include large outdoor hot tubs with spectacular mountaintop forestry views, large wraparound decks, wifi to upload all the breathtaking pictures you take, and a game room with either a pool table or arcade-style video games. When you're ready to leave the cabin, and begin a day of adventure head into Gatlinburg and check out the Polaris Sling-Shot self-guided tour. The Sling-Shot is a three-wheeled exotic all-terrain vehicle that you can zip around Gatlinburg in and take in all the sites in sounds the city has to offer. You can also take the Polaris off-roading, bank corners, and speed around just like a Nascar driver! If a calm relaxing vacation is more your forte, consider heading into downtown Pigeon Forge, and enjoy a day filled with many unique retail experiences. When you are finished shopping drop your bags off at the car and head into one of the many restaurants offering both dinner and live entertainment all for one low price. SMBYO.com is your one-stop shop for all your vacation planning and booking. We offer a large variety of cabins to accommodate groups of all sizes. We also offer a variety of pricing options on our cabins so whether you're a big spender or looking for a budget-friendly vacation SmokyMountainsByOwners.com has you covered.